How do we chose a keyword for our blog posts? If you want people to read your blogs, you need a strategy for every blog post to get found in search engines. In other words, you should SEO your individual blog posts. This starts, like any SEO project, with good keyword research. Our approach is to fish where the big fish are. We’ll chose a blog post topic AFTER THE KEYWORD RESEARCH! This post for example, started as an idea about Blog SEO, but after researching what people are searching on, we decided there was too much competition on the term “Blog SEO” (40,500 searches last month) and narrowed the scope to “blog keyword” (2,400 searches last month) as part of our long tail strategy. And hey, you found us! Tip: A search on the plural of a word or phrase is not the same as a search on the singular. In the above example, there were only 1,000 searches last month for “blog keywords” so we went with “blog keyword” which had 2,400. So how do I chose the right blog keyword? We don’t have a formula to weigh the three factors, but try to find a balance. For example, the higher search volume or competition, the tougher it will be to rank on page one, but if from our analytics we know a certain keyword will provide a better ROI, we may want to go after it anyway, even if it will take us several months to rank well. 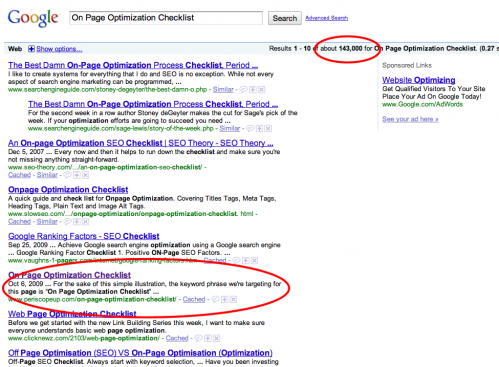 For this post, our goal was page one quickly, not high search traffic. We like the old standby, the Google External Keyword Tool. It will give you both global search and local search volume. Be careful here, because the use of the word “local” is misleading. According to Google, it means search volume “specific to your targeted country” as opposed to global search volume which “includes traffic in all countries and languages.” We’ve suggested to Google that they make local search volume available as a radius from your city or town. To us, this would be more valuable “local” information. There are a few ways we determine competition for a keyword. The first is the number of results for a specific search. Search Google, and on the top right, you’ll see the number of results returned for that term, or the number of pages that are “competing” for this term. The other way we judge competition is by spying. Use a site like compete.com (paid) or spyfu.com (free) to see what you’re competition is up to. Tip: log into your Adwords account when you research search volume, and you’ll get the Cost Per Click of what people are paying to bid on terms. This will also give you an indication of competition in the marketplace. You can only determine if a keyword phrase will provide a good return on investment if conversion tracking set up on your analytics tool. It’s best to have several months of data, but the idea is to determine which keywords lead to the most cost effective leads, your cost per conversion. This is an involved topic, subject to another post, but if you setup Google Analytics, for example, to track conversion goals, you should be able to run reports and determine which terms produce and which do not, and at what cost. The fastest way to get a blog post high on search is to select your topic and write your post AFTER you select your keyword term(s). Your next step after selecting your blog keyword would be to write the post and optimize it for that keyword. Don’t forget to track your SERPs and build optimized links directly to your posts to push your blog post up the search engine results.